Bienvenue à Casa Campana, toujours parmi les mieux notés les propriétés de location de vacances de sud de l'Arizona. Cette superbe maison traditionnelle de 3 000 pieds carrés (avec plus de 1 000 pieds carrés de terrasses couvertes) est située sur un terrain privé dans les contreforts des montagnes Tortolita, dans le nord de la région de Tucson, à proximité de la communauté de villégiature de Dove Mountain. Le majestueux désert de Sonora est à couper le souffle et parfait pour le vélo, la randonnée ou simplement se détendre et profiter de la beauté environnante. Profitez du cadre privé avec des vues incroyables tout en conservant une proximité des commerces, des grands restaurants et certains des meilleurs parcours de Tucson a à offrir. Ouvrez la porte à la sérénité de la cour avant, idéal pour profiter de votre thé le matin, le curling avec un livre, ou de partager des dîners intimes. La fontaine apaisante, colibris fantaisistes, aménagement confortable, et l'éclairage magique du soir offrent solitude unique et un refuge calme. Une fois à l'intérieur de la villa, vous serez séduit par la grande chambre spacieuse avec planchers de béton poli, de hauts plafonds avec poutres apparentes et impressionnante boiseries personnalisé tout au long. Avec sa table de championnat de billard, écran plat de 60 pouces, Bose Surround choix les derniers médias son et, cette grande chambre dispose d'innombrables options de divertissement. cuisiniers exigeants se sentiront inspirés dans la cuisine entièrement équipée, équipé de pair avec une résidence principale avec armoire à épices approvisionné, et un compliment plein de gadgets, petits appareils et de couverts même en Chine. Aucun détail n'a été épargné. La suite de maître le roi frappante est joliment meublée et comprend un petit espace de travail de bureau, vue sur les montagnes Catalina et accès direct à la terrasse couverte, bain à remous et piscine. Le maître de bain offre une grande douche de plain-pied avec deux têtes et grande baignoire séparée idéal pour la détente intérieure. La suite principale et trois tout aussi charmantes chambres d'hôtes comprennent toutes une télévision à écran plat avec accès DishTV / Hopper DVR et un lecteur de DVD Blu-ray. L'arrangement de lit inclut: Chambre à coucher principale - Roi, «Chambre de Tahoe» - Roi, «Chambre à coucher du sud-ouest» - Reine, et «Route 66 Chambre à coucher» - 1 Reine et 1 Plein. Alors que l'intérieur de la maison est très confortablement meublé et équipé, la vie de l'Arizona est tout au sujet de l'extérieur. Profiter du beau temps exquise année des espaces de vie extérieurs vastes compris patios couverts entièrement meublés, un spa et une piscine chauffée avec plan d'eau de roche naturelle à quelques pas. Perdez-vous dans la beauté environnante, prendre le soleil dans le lagon ou la sieste sur le bord de la piscine couverte Bali Bed par jour; ou en regardant les lumières de la ville tout en rassemblés autour de la fonction de feu de gaz par nuit. Cette oasis en plein air de Sonoran est sûre de captiver avec sa faune et beauté environnantes de désert. Notes de transport: la route vers Casa Campana comprend un segment très court (1/8 de mille) de route de gravier compact et plat entre notre voie et la rue de la ville. Cela ne veut pas inhabituelle pour la zone. Si vous arrivez en véhicule récréatif, un espace de RV avec branchement électrique est fournie. Comme indiqué dans notre section Tarifs, le chauffage de la piscine est facultatif et n'est pas inclus dans les frais de location. Contacter le propriétaire pour l'estimation et plus de détails. Nous sommes sincèrement heureux de vous accueillir à Casa Campana. PARTIES avec de jeunes enfants, Se IL VOUS PLAÎT NOTE: Piscine et Spa sont ouvertes au reste de l'arrière-cour et ne sont pas clôturées séparément / fermée des patios arrière, espaces extérieurs, ou des portes arrière de l'immobilier. Se il vous plaît prendre cela en considération lors de l'examen de cette propriété pour vos besoins de vacances. 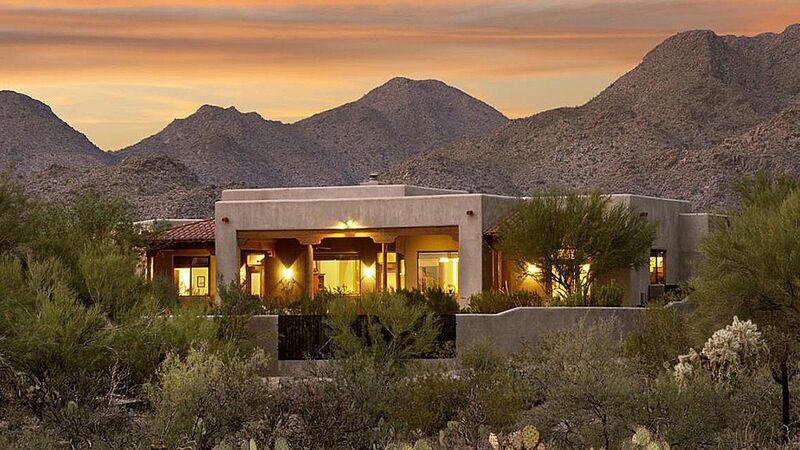 Everything we hoped for:) beautiful desert evironment and perfectly appointed loving home.. Perfect in every way.. thank you!!!! We are pleased that you found our home perfectly appointed. We stay their frequently ourselves and as such we strive to make sure it has everything that we need when we gather with our own family and friends. Casa Campana has been a true labor of love for us and it is very rewarding that our house continues to please our guests. We hope that you can stay with us again. Believe everything you read about this property and the owners are the best. It is the most amazing rental property we have ever stayed in and we have rented quite a few ! As a super bonus for us foodie types the kitchen was very, very well equipped and fun to cook in in every way. If you ever can bring yourself to leave the gorgeous compound grocery and fabulous hiking are only minutes away. This is the place for a special family get together with lots of communal and private spaces along with the peace and tranquility of the beautiful Sonoran desert, You can look and look but you won't find better than the Casa Campana. Our family wanted to return to Casa Campana because it was such a wonderful experience last year. We felt like we were returning to a second home and enjoyed the comfortable home, beautiful outdoor living areas and surroundings as much as the first visit. Mark and Susan go above and beyond to make your stay as memorable and pleasing as possible. Communication is prompt and thorough which was much appreciated. Hands down, this was again one of the best rental experiences that any of us have had. Thanks so much Mark and Susan and, did I mention that we would like to buy shares in the place?! Thanks so much for your glowing feedback and joining our beloved group of returning guests. We’re happy the Casa consistently delivers a wonderful, relaxing experience for your family, and you all feel at home. That’s our goal for each and every group, so it’s nice to hear. We look forward to welcoming you back next time. I have been tasked with composing a thank you note to you on behalf of the four of us who had the pleasure of staying in wonderful, beautiful Casa Campana. Let me begin by saying I think I know both of you without having met you. Your home is the embodiment of two people who have lovingly assembled a welcoming home for us to so thoroughly enjoy. The setting is quietly spectacular sitting nestled into a space you have made into a wonderful desert oasis of fun, relaxation and memories. I can’t think of anything that has not been thought of in this home...the beautiful pool, relaxing hot tub, the outdoor kitchen, fire pit and multiple conversation areas. Your gift for accenting the many peaceful seating areas is like nothing we have ever seen. Wow, Wow! We played many rounds of golf with friends at the Gallery and ladies manage to hike every trail at the Ritz. Yesterday they managed 12 miles in 4.5 hours! The men? We did nothing but prepare a wonderful steak dinner for friends, all the while enjoying the sunset and the sound of the waterfall gurgling into the placid water out of the pool. Unfortunately, the cooler nights prevented us from eating on the outside table, but no worries, Christmas lights kept us warm and peaceful inside. We enjoyed Game of Thrones and planning one last day in paradise! Thank you so much for sharing your beautiful home with us. We are already planning another trip to Tucson Valley to enjoy this experience again. Until this time next year, thank you from all four of us and have a wonderful Christmas holiday. Thank you so much for your wonderful and thoughtful review. We're so glad you made the most of your vacation, both relaxing at our desert oasis, and out in the wonderful surrounding Tortolita foothills. You hit on so many things we love about Casa Campana ourselves, and which contribute to the unique vacation experience we hope all our guests receive. Thanks for contributing such a delightful milestone (75th!) review. We'd love to host you all again in the future. Stay warm!! What a tremendous week we had. This was by far the nicest home I have had the pleasure to rent and I'm a young 64. I would like to purchase this home if I could! Mark?? Not to mention every possible amenity you could imagine is in the home. If you cook, rent this place. If you like a great pool, rent this place. If you like amazing sunsets, rent this place. Did I mention the firepit? No really rent this place. We started off with a beautiful goodie bag when we arrived. Very nice touch. The home was spotless and Mark was kind enough to show us how everything worked. Just in case you weren't paying attention, there are instructions for everything, absolutely amazing. Don't waste your time looking at other homes. This is the real deal. I am almost reluctant to give such a great review, keep this place a secret. If I could give it 10 stars, I would do it. We had 3 couples and there was more than enough room. Even the pool towels were top notch. I can not think of one negative thing. The pool got cool one morning and all I had to do was call Mark and the heater kicked in. We were spoiled for the entire week. Lots of plans to go see things but why leave this place??? It rained one day and Mark was kind enough to text me about movie theaters in the area. Folks, this is not your normal VRBO rental. I guarantee you you won't be disappointed. We will definitely be coming back and you should book this as soon as you can, you'll thank me later! Mark, thanks for being such a great host and I look forward to our next visit. You do a great job! Thanks so much for your glowing review. You touched on so many of the reasons we love Casa Campana ourselves. It was a pleasure to meet you and your group. We look forward to hosting you for many return visits to the Tucson sunshine in the future! You are always welcome with us. Everything you could ever want in a vacation rental! Casa Campana is a beautiful house with everything a person could need or want. You can tell the owners take great pride in making sure their property is in tip-top shape and up to date with all the latest amenities and technology. We were impressed with the photos listed on the website, but blown away when we actually arrived. The house is beautifully furnished with lots of space for all guests and the backyard feels like it’s own private oasis. There were days on our trip where we all decided that we weren’t going to leave the house at all and just spend the day in the backyard! We definitely hope to come back again soon! We are thrilled that you enjoyed your stay and that you have already booked a return visit. We love our time at the Casa too and also find it difficult to leave our desert oasis. We always make plans to visit a new place, but more often than not we talk ourselves into staying put. We look forward to hosting you again next year. Case Campana est situé dans les contreforts Tortolita montagnes au nord de la grande région de Tucson et à proximité de la communauté de villégiature Dove Mountain, y compris les clubs de golf Dove Mountain, la galerie et du patrimoine et Ritz Carlton Resort. Seule une courte distance en voiture sont loin des principales attractions de la région de Tucson, y compris Mount Lemmon, Biosphère2, La Sonora Desert Museum, Old Tucson, University of Arizona, et de nombreux grands clubs de golf zone. Autres activités à proximité populaires comprennent montgolfière, excursions hors route, et la montagne et le désert randonnée. Dove Mountain, l'ancien site du tournoi Golf Accenture Match World est à seulement quelques minutes. Assez proche pour des excursions de Casa Campana, Tombstone historique, Kartchner, communauté artistique Tubac, Mt. Lemmon SkyCenter Observatoire et l'Arizona Wine Country sont toutes les destinations populaires auprès des visiteurs. Situé sur une voie privée de 3+ propriétés acre, Casa Campana se donne une grande expérience du désert de Sonora, y compris une abondance de plantes du désert / arbres, cactus, oiseaux (y compris les tourterelles, les faucons de la nuit, les colibris, ...) et désertiques animaux tels comme javelinas, les coyotes et les cerfs. Le cadre naturel et la vie privée de la propriété seront appréciés par tous, mais la commodité ne est pas sacrifiés avec des restaurants, des boutiques et autres services de moins de 5 minutes. Pool Heating at additional fee - quote upon request Additional Guest Fee of $75 per stay for parties of 9 Additional Guest Fee of $150 per stay for parties of 10 Cancellation/Refunds: 60 days prior to reservation arrival date, or more: 100% refundable less $150 cancellation fee to be subtracted from refund. Less than 60 days but prior to 30 days prior to reservation arrival date: Refund will be 50% of rental cost for the entire reservation. 30 days or less prior to reservation arrival date: No refund. "Property Fees" line item is a required $59 Accidental Damage Waiver as described in detail in Guest's rental agreement.